Miller believed in the value of self-improvement through education and he sought to improve the lives of those less fortunate, particularly people local to his many property interests. He was involved with local government at various levels but realised he could have a greater effect as part of the national government in London. Equally importantly, he had the wealth necessary to fund such an ambition. Two of his contemporaries — Robert Stephenson and Joseph Locke — had become Members of Parliament (MPs) in the 1847 general election, and perhaps this strengthened his resolve to seek public office. Stephenson was Conservative MP for Whitby, and would be re-elected in 1852 and 1859. Locke, a Liberal, was joint MP for Honiton continuously until his death in 1860. Miller always stood as a Liberal Party candidate, though some people — mostly his opponents — thought his views more in accordance with the Conservative Party. As well as expounding Liberal Party ideals, he claimed to be both "independent of all party" and "a progressive conservative". 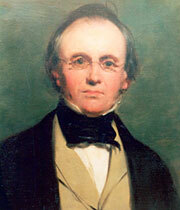 His first candidature was for the Stirling Burghs (Stirling, Culross, Dunfermline, Inverkeithing and Queensferry) in the 1852 general election, two years after his retirement from engineering. Apparently he had refused to stand for the Ayr Burghs (Ayr, Irvine, Cambelltown, Inverary and Oban), even though he was born in Ayr. Constituency polling day was 13th July 1852, though, as was common at the time, countrywide voting took place over a few weeks. Miller lost by only 20 votes to fellow Liberal Sir James Anderson (1800-64), a textiles manufacturer and Lord Provost of Glasgow 1848-51. Miller returned to his estates and devoted the next 13 years to various ventures. During this period, his only son John embarked upon a military career. In November 1858, not quite 18 years old, young John Miller received his commission as an Ensign in the 60th Royal Rifles and served at Dover in Kent and in Ireland. In June 1861, the regiment departed Liverpool for Quebec in Canada, aboard the SS Great Eastern, designed by Isambard Kingdom Brunel. Miller would never see his son again. John served in Quebec and Montreal, and was promoted to Lieutenant in May 1863. While travelling home on leave aboard the SS Edinburgh, he died suddenly — cause unknown — on 2nd August 1864, aged 23, and was buried at sea. This tragic event may have been the catalyst for Miller and his family to move away from Polmont, where Millfield House would have been full of reminders of John. The Edinburgh town house he owned at 2 Melville Crescent also was an ideal base for Miller's second attempt at becoming a Member of Parliament. The 1865 general election came less than a year after the death of Miller's son. Perhaps he needed an all-consuming challenge. By then he was 60 years old and may have decided that it was now or never. His characteristic determination to succeed is shown by a comment at one election meeting, where he said, "I have not been in the habit of retiring from anything that I have set my mind to". This time he stood for the Edinburgh constituency on a double ticket with Duncan McLaren (1800-86), Lord Provost of Edinburgh 1851-4, and they shared the electioneering costs. Their rivals were the Lord Advocate James Moncrieff (1811-95) and publisher Adam Black (1784-1874), though all four were Liberals. On 13th July 1865, McLaren and Moncrieff won by a combined margin of 982 votes, with Miller taking 23% of the vote. However, Miller's financial support for McLaren wasn't forgotten and the pair campaigned again for the 1868 general election. They were returned unopposed and entered Parliament on 17th November. Miller was an MP for six years (parliament could sit for up to seven years at that time). In the House of Commons he spoke about education, religion, the poor and matters related to engineering. During that time, he lived in a town house on Hyde Park Square (probably at No. 33) in Westminster, London. McLaren turned against him for the 1874 general election and decided to canvass with James Cowan (1816-95), Lord Provost of Edinburgh 1872-4. Miller was persuaded to try for re-election by a number of trade union members who recognised his independent views on schools and the working class. He stood as an Advanced Liberal against McLaren and Cowan, with the Conservative John Hay Athole Macdonald (1836-1919) as the fourth candidate. Polling day was 5th February 1874, and McLaren and Cowan won by a combined margin of 8,249 votes. Miller won 19% of the vote but didn't stand again. During his years of retirement, Miller also held various positions in local governnment. Two of the highest were his appointments as Deputy Lord Lieutenant for Kincardineshire and Deputy Lord Lieutenant for the City of Edinburgh. He was Commissioner of Supply for Kincardineshire and for Peebles-shire, and a Justice of the Peace for Peebles-shire, Stirlingshire, Kincardineshire and Linlithgowshire. Miller saw no shame in his lowly origins, saying after his failed attempt to win a seat at the 1852 election, "I have come from the working classes, and I have succeeded to no inheritance but by my own industry". And it proved to be a very wealthy inheritance.